Whether you’re pro or anti Hillary Clinton, you have to admit that a woman running for President of the United States is a good thing. We live in a county where 50.8% of the population is female and yet historically all 44 presidents have been men. The U.S. is a bit behind when it comes to diversity in political leadership. Other countries have elected female heads of state (Israel, Germany, the United Kingdom, Portugal, India, Norway, Pakistan, and quite a few others) and about 18 nations are currently run by a woman. Despite this, women have been running for president for a very long time. 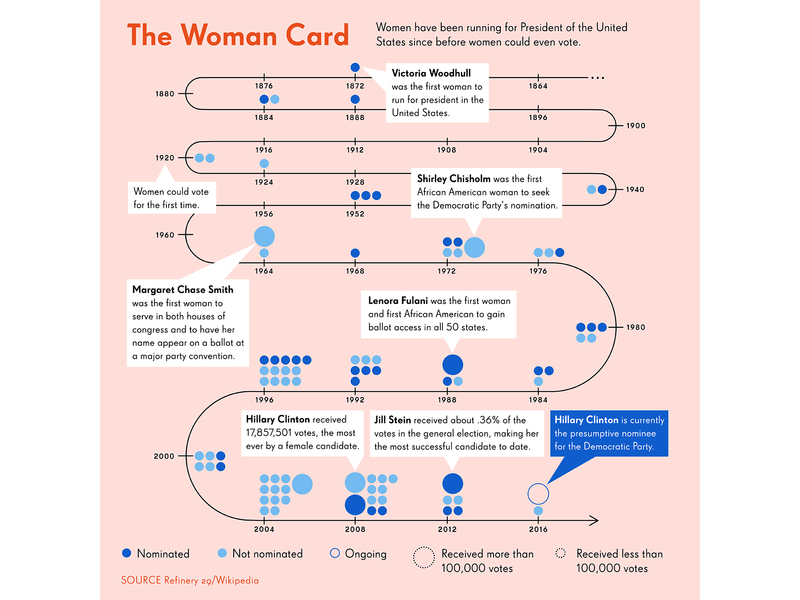 This inforgraphic gives a quick rundown of other times when a woman has run for office. It’s interesting to note that some of them were running before women even had the right to vote.